My goal is to learn to travel with my Brompton bike so that it is as simple as taking a carryon. My ultimate purpose is to take my “Black Beauty” to Europe next summer as I follow the Tour de France. 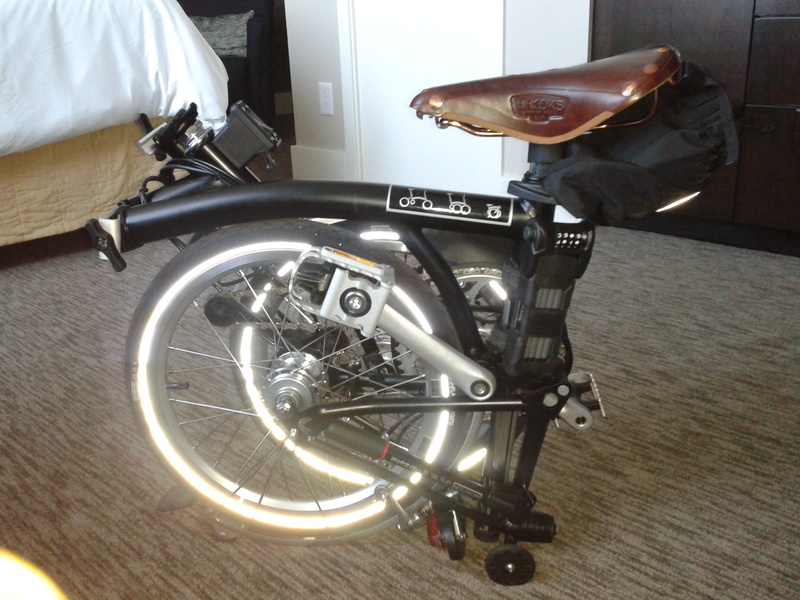 When I recently bought my Brompton foldable bike in Portland I brought it home on the plane; however, it was not a fair test of ease-of-travel because I also had a suitcase and a backpack. 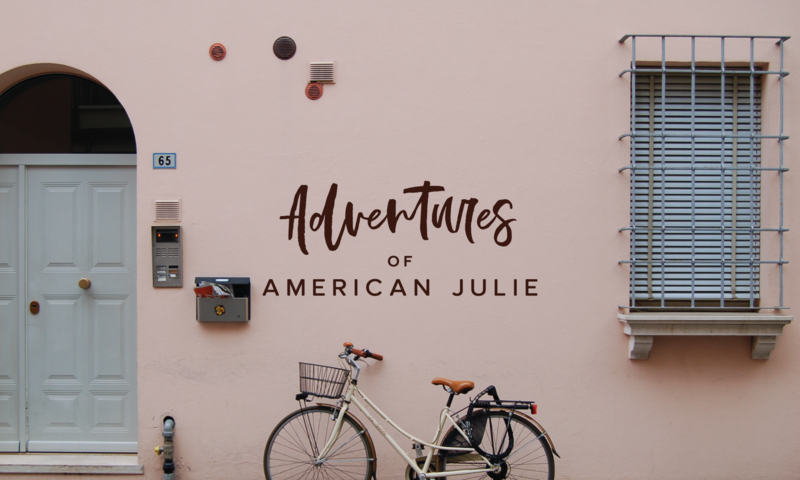 This trip I am on the go with just my bike, my Baggalini purse and my Brompton bag that slides conveniently on the front (like a basket). I did not bring my bike lock because it is heavy and I want to try to bring my bike along wherever I ride. Nor did I pack my bike helmet. I am hoping I can borrow one. The size and inflexibility of a helmet is a “pack-light” challenge. While packing, I discovered quite a few pieces in my wardrobe that are beyond their expiration date. No worries: I am going to New York City. Shopping is always on the agenda. And I have time on Monday to ship a box home if necessary. Getting from the parking garage to the gate I abandoned the supposedly easy method of pulling it completely folded, with bag on front using bag handle. With any real weight in the bag it seems to be dragging on something. 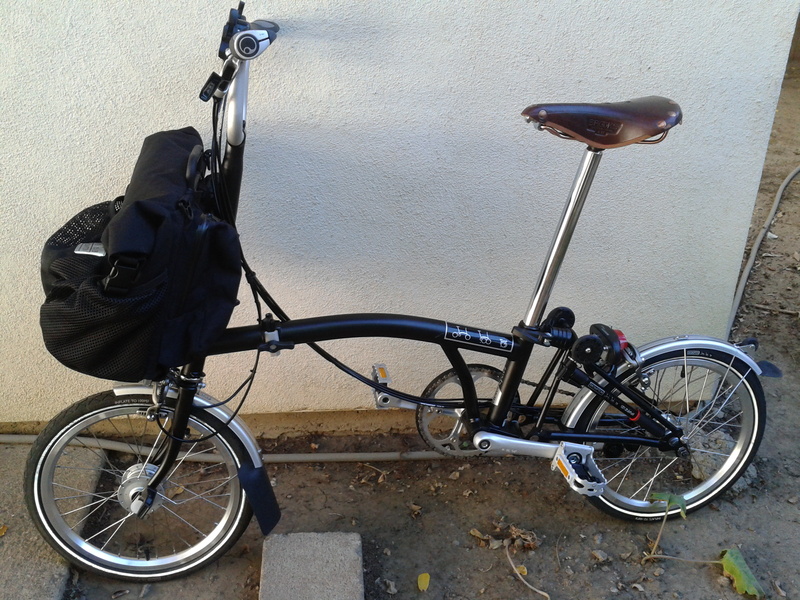 So I removed the Brompton bag and brought the handle bars up and continued on my way carrying the Brompton bag in one hand and wheeling the bike by the handlebars with the other. Even that proved tricky and I ended up controlling the bike from the fork of the handlebars. Getting through security was very straightforward. The folded bike glides through easily. At the gate I removed the clamps and the seat and put them in my bag, then wrapped the bungee cord I brought for the purpose. As I gave the Southwest staff my ticket at the gate she asked me what I was bringing aboard. Instead of saying it was a bike, I replied, “It fits in the overhead compartment. And if it does not I will check it.” She offered to let me try and then if not, ask to put it in the closet for wheelchairs. (!) This was much friendlier than the staff at Portland. Lucky me, this Southwest plane is a modern Boeing 700 and the overhead compartments are just big enough. The gentleman behind me saved the day: with his extra height he was able to slide my bike in and close the door. It works when the wheels are facing out. Hooray! It is more exhausting than I thought it would be and I am hoping that I get accustomed to the weight and the mechanics of it as I go along. I was able to load my bike in the overhead easily by myself from Denver to Newark. When I got off in Newark I stopped immediately and unfolded Black Beauty and reattached the seat and clamps. I had two fascinated airport workers with lots of questions watching me. I put my Brompton bag on and pushed along. This is a much better solution because people find the novelty of a bicycle in the airport amusing and it takes much less physical effort. Plus if there is an opportunity to ride (through an empty baggage claim area to the women’s restroom in Timbuktu) I can just hop on (just sayin’). The rest of the trip became a typical travel f-up. The plane was delayed leaving Denver so we arrived at Newark at 12:15. The AirTrain was on reduced schedule after midnight. Instead of waiting for another one in 15 minutes, I hopped on Black Beauty and rode from Terminal A to Terminal C. The staff at the AirTrain stations were all terrific and walked with me until they could show me exactly where I needed to go. The cool air and light exercise was refreshing. Unfortunately the only way to get to the Rail Station is by AirTrain. Eventually I got there, but the trains never did. Electrical problems had all of the trains woefully behind schedule. Now it is 1 a.m. I was supposed to be at Penn Station by now in my original plan. At 1:30 a.m. a group of us gave up and reboarded the AirTrain for Terminal C to catch cabs. And my final travel indignity: getting reamed by the cabfare: $51 to Chelsea plus round trip tolls of $18 plus tip—on top of my train ticket. Makes me rethink my enthusiasm for flying into Newark. The true measure of traveling with my bike is how much I enjoy Black Beauty as transportation when I get to Chelsea.